VIDEO: Mannequin Challenge Becomes A Global Phenomenon : Goats and Soda The online craze has gone global. Watch videos from students in Indonesia, radio deejays in Morocco and temple visitors in Nepal. Freezing up for the #mannequinchallenge in Nepal. Yes, we're talking about #MannequinChallenge. The internet craze that was reportedly born in a high school in Jacksonville, Fla., and has flown as high as Hillary Clinton's charter plane before Election Day — now has become a global phenomenon, trending in countries like Egypt, India, Nepal and Nigeria. The challenge, as NPR reported in a piece last week, isn't so much a competition as a physical feat: "People stand still. That's the short version, but really each clip consists of people remaining completely motionless for about a minute as the camera winds its way through the area." Many of these videos were made by tech-savvy students and young professionals taking a break at school, sports practice or the workplace. Athletes on the Egyptian National Taekwondo Team freeze while doing sit-ups, high kicks and weightlifting during a training session. During an India vs. England match at the Saurashtra Cricket Association grounds, commentators strike their pose while pouring tea, flipping through the paper, peering through binoculars and even combing their hair. Schoolkids at recess play cards, eat snacks, fly paper airplanes and scroll through their cell phones. Deejays and staffers at the Hit Radio station in Morocco attempt the challenge live on air. Scroll to 2:30 to see them in "action." 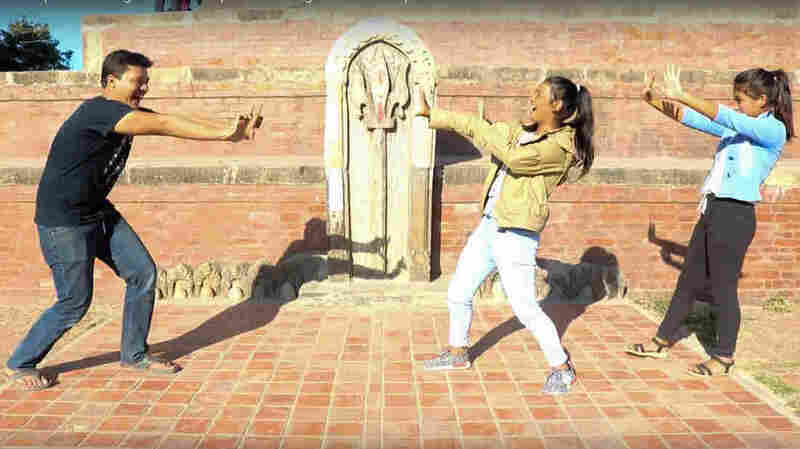 Young visitors at the Uma Maheshwor temple in Kirtipur, Nepal, combine two memes at once: the 2013 Hadouken trend, where people pretend like they're throwing balls of lightning at each other, Street Fighter-style, while freezing up for #MannequinChallenge. A comedian named Crazeclown and his posse watch the U.S. election results on CNN. When the winner is declared, the Nigerians, wearing traditional garb and balancing parcels on their heads, make a beeline to the door, stop-motion style.